One of the many wonderful qualities grandmothers have is their tendency to save the things their grandchildren create. Even if that thing is a letter from 10-year-old me to a publishing company about the “many careless mistakes and common errors” I noticed in their textbooks. I grew up in a suburb of Cleveland, Ohio and loved reading from an early age. My mom had immigrated to the United States from Greece when she was 14. I had grown up on her stories of the importance of education and how learning and knowledge had the potential to transform lives. It was largely because of her that I was such an avid reader. Maybe because I read so much, or maybe because I was simply precocious, but I noticed when the textbooks we used had errors, were out of date, or were simply poor quality. By the fifth grade, I decided enough was enough. I wanted answers about why these “in-charge grown-ups” thought it was okay to send my teachers and classmates materials that were so clearly below par. My aunt, who was a teacher and principal, sat me down in front of a typewriter and I poured my heart out—not just about about my concerns regarding the materials, but about why this mattered to me and what I hoped for the future. I think at heart I wanted to express what had stayed with me from my mother’s stories: that the quality of my education would have a direct impact on the kind of life I would ultimately lead. I recently revisited this two decade old letter after the EdReports content review summer training and was struck by how much the kid I used to be predicted the person I would eventually become. 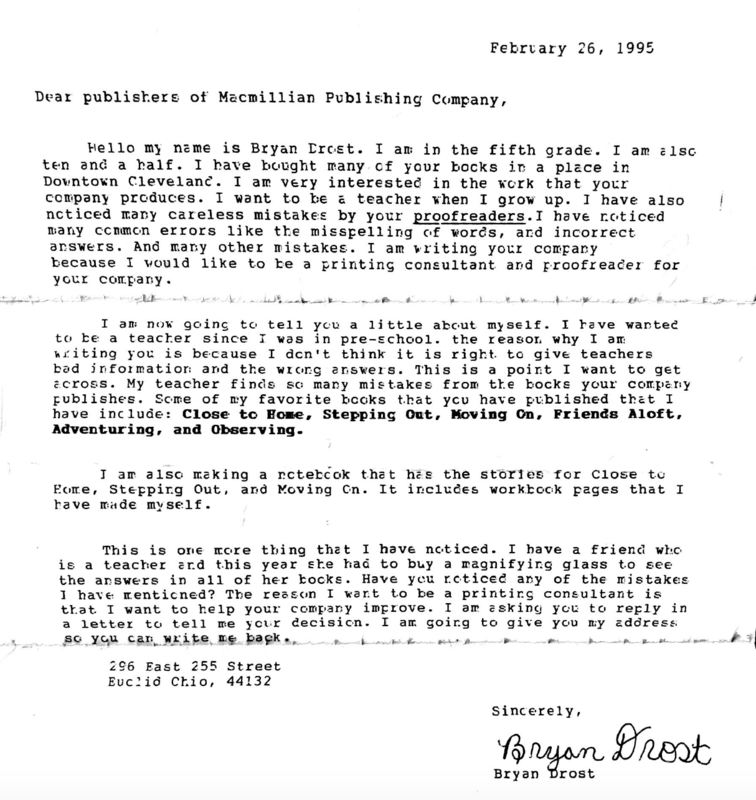 In the letter, I tell the publishers that I wanted to be a teacher since pre-school. That was true and remained true as I finished high school and went to college majoring in education. I graduated early and accepted the first teaching position I interviewed for and was offered. I taught for 10 years and the quality of instructional materials impacted my students every day. I worked in a large district and we didn’t have textbooks that met college- and career-ready standards. This meant, even as a novice teacher, I was educating myself in the standards and creating my own materials to meet them. Hours of work went into this process—hours that I could have spent working independently with students who were behind or simply getting home for dinner at a reasonable time. But I invested the time because I knew, exactly what I sensed 20 years earlier, that materials matter. That quality materials guide teachers to make good instructional choices for kids. That quality materials support teachers to use their energy and creativity to inspire students at all levels to learn. That there’s no more powerful combination than a dedicated, passionate teacher and a text that awakens students’ minds and challenges them to think in a new way. I felt so strongly about the transformative power of great materials that I devoted myself to a doctorate in curriculum and instruction. I now work as a central office administrator focusing on curriculum, instruction, and technology for a school district in Ohio and a region in the greater Cleveland area. Outside of this role, I’m also involved in the exciting work of EdReports as an educator reviewer where I can continue honing my skills evaluating instructional materials with fellow educators from across the country. I never received a reply to my letter from Macmillan Publishing Company. It was only in re-reading my own words that I recently realized, in a way, that my whole professional life has been dedicated to finding the answers I sought all those years ago: How can we ever accept poor materials in the hands of our kids? How can we offer our teachers anything other than the very best resources and tools to meet the challenges they face? I miss working in the classroom, especially the day-to-day relationships I formed with my students. But it was because of the students I taught and worked with for years that I became an administrator. I knew that by devoting my experience and knowledge to the field of curriculum and instruction, I would have a chance to impact students— even the ones I’ll never meet— who depend upon great teachers working with great materials for success.